Theresa recently cleaned out her library and I was the happy recipient of Knit Socks! 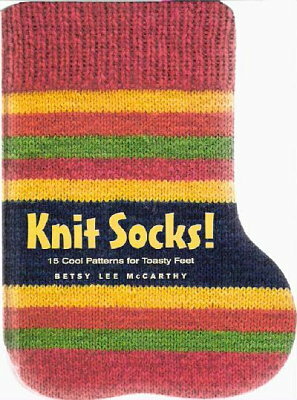 15 Cool Patterns For Toasty Feet by Betsy Lee McCarthy. 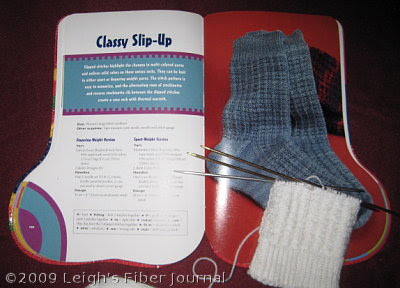 I love wearing handknit socks, I love knitting them, and I love collecting sock pattern books. ... from this post, I'm A Sucker For Sock Yarn. Fortunately this pattern was also on my "must knit" list. The stitch pattern was easy to memorize and it is very pleasant and relaxing to knit by the fire at the end of the day. If feels good to be knitting again. What a great book - cool shape too! There is something very satisfying about sitting in front of a fire making something. I hope you have lots of fun! Knitting and long winter evenings just belong together! It's funny the different approaches - I love a hand-knit sock too, but always knit the same, plain thing. The only variation is the number of stitches/rows (I have cards with numbers for me, husband and sons). There are some great yarns around now. Your original choice of colours is particularly nice. Nice sock pattern. Enjoy sitting by your nice warm fire and knitting. Doesn't get much better than that. I'm totally jealous! I love hand knitted wool socks. I've been itching to make a new pair for moi but the only skein of sock yarn I currently have is slightly thicker than I normally like to work with. Every swatch and sample I work up, I dislike, although I love the colourway of the wool. No wool stores for km and km around, so it will be a while before I can get something that I like - and I'll be more careful about choosing it. I will have to enjoy your success vicariously.. keep us updated on your progress.. Okay, I'm way jealous that you have one pair of socks done and another already started. It takes me FOREVER to finish a pair of socks! They look great too. Glad the book has offered up some nice patterns for you. I love knitting sox too, but I tend to knit too loosely. With the yarn that you have, I'd have to use size 0's (and cast on 72 stitches for my size 7.5 feet). Glad you found a pattern that would work. 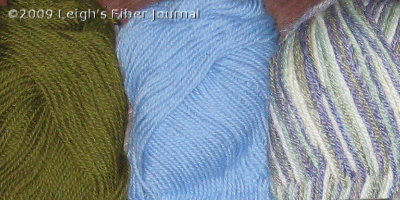 Check out KnitPicks for excellent needles - their nickel dps are great. That headline makes knitting socks sound like the perfect way to pass the winter! Glad that you're actually making something out of Theresa's books. I'm still just dreaming!! Charlotte it is a great book and has a lot of really nice patterns in it. Judy, at least you always know the pattern! Theresa, I'm pretty slow these days too. But I do like the book and the patterns and can't thank you enough! Laura, thank you for mentioning KnitPicks. I'd forgotten all about them. I love their yarns. I have one of their circular needles but have never tried their DPNs. I appreciate the recommendation. Sue, if I can't spin or weave, I'll knit! Socks are the best therapy - I agree with you. I always have a pair on needles. I'm glad you've been able to find the time to get back into the knitting groove. I have that book too and love that pattern! I confess that I have yet to knit it, but it is on my to do list.